For Thirteen Days in 1962 the world stood at the brink of atomic destruction as the United States and Soviet Union faced off over missiles which had been placed in Cuba. Would the USSR back down and remove the missiles? Would the US push forward with a full invasion or send bombers towards targets withing the Soviet Union? Who would blink first? 13 Days is a game recreating the tension of those two weeks as players play cards which shape political events around the world. 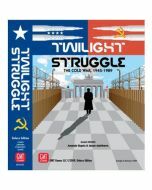 Twilight Struggle in 45 minutes. Great introductory product for card-driven games. Includes a full-game example with commentary, as well as historical notes.